Ferrari finally managed to get their strategy under control in Australia and pulled a victory away from Mercedes. 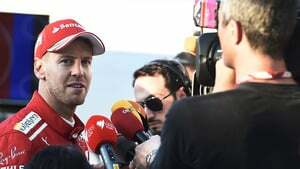 Sebastian Vettel inherited the lead when Hamilton pitted with worn out tyres, and the German put in some fast laps to gain enough time to secure the position when he took his own stop. It was a race of mostly one-stopping, with many retirements along the way. Haas suffered a double DNF, with Romain Grosjean the first driver to stop with an engine problem. Palmer, Ricciardo and Stroll all brought their difficult weekends to an early conclusion, whilst Fernando Alonso got within four laps of the end of the race before his McLaren gave up the ghost.